Many theories and speculations exist about them being the same person or that they are somehow connected. It is only logical as their appearance is identical, if we exclude Tashigi’s glasses. They must be of similar age and they both have(Kuina had to be exact) swordmanship(or swordswomanship for that matter :P) as their dream. Also, they both have a type of rivalry with Zoro, who did mistake Tashigi for Kuina when he first saw her. On the other hand, there are facts that contribute to the idea that they are a separate character and in fact not connected as many believe. Firstly, Kuina is supposed to be dead(duh!). 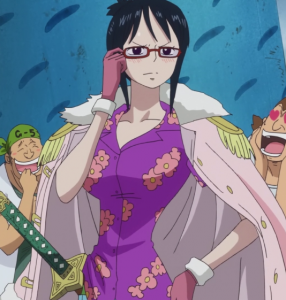 Furthermore, Tashigi wears a pair of glasses and is a part of the Marines. To the contrary, Kuina was the daughter of a swordsman master and her dream was to become the greatest swordsman herself. Lets delve into two different but equally fascinating theories about them. 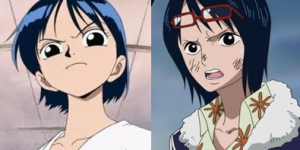 The first idea we ‘ll explore further is that Kuina and Tashigi are in fact the same person. They look the same and they have the same aspiration. Heck, they even have a similar swordmanship. Lets go as far as to assume that Kuina didn’t die then. The main problem is, why doesn’t she remember Zoro? Assuming she doesn’t pretend to not remembering him, the following scenario seems a possible explanation. We all remember the fight that happened between Zoro and Kuina. They exchanged their dreams of being the greatest swordsman and it must have been the first time for her to see someone really believing in her dream. Excited, she went back to her father’s dojo and shared her enthusiasm with him hoping for the best. We all remember the fact that he didn’t want his precious daughter to become a swordsman. That’s the reason he shattered her enthusiasm, told her he speaks nonsense and forbade her from becoming a swordsman ever. Upset and shaken she storms out of the dojo falling down the stairs and staying unconsious. The doctor’s verdict? She ‘ll survive having no recollection of her past self. Now was the time for her father to grieve, but also an opportunity for him to shape his daughter to what he wanted her to be and protect her from her own dreams. He decides to send her away under the care of the Marines. That would be the place for her away from dangerous pirates and rogue swordmen. Her dream though surfaced again but in a different environment, making her the girl with the sunglasses with a heightened sense of justice, Tashigi. Away from Zoro or a protection? The reason Kuina’s father decided to fake her death in front of Zoro could mean two things. He either wanted to protect her from Zoro, and the dreams he represented. On the other hand, he just may have wanted to protect Zoro from blaming himself for what happened to Kuina. After all, he was the one she fought the night of the accident, and the person who inspired her to pursue her dream. Lets start off with the obvious. If Kuina had a sister, why is it that Zoro had not met her? A really possible explanation could be that Tashigi never entered the dojo. This is quite probable if we considered two facts. First of all, Kuina’s father didn’t want his daughter to follow the path of a swordsman, believing it to be dangerous and difficult for her to compete against men in the future. The second reason is Tashigi’s clumsy nature. We have seen the way she behaves even now that she is an experienced adult. Imagine her being a little brat in the dojo. Probably a nightmare her father wanted to avoid. How did she learn to yield a sword? The big question is how did she end up being a swordswoman? The answer exists in her deceased sister Kuina. After she learned to use a sword in the dojo, she went on to teach everything she learned to Tashigi. That way, their common way of swordsmanship can be explained. But how did she end up hunting down users of legendary swords she considers a threat? The answer lies to the way Kuina died and it wasn’t by just falling down some stairs. It all started when Zoro challenged her to a duel with real swords. In order to take part in that fight, she took a legendary sword from her father’s dojo. Then, she went off to meet Zoro for their appointed fight. Their clash of swords happened the way we know, but with a caveat. Their duel was observed by a shady character. That person must have been someone hunting down legendary swords for his own benefit. After realising how important and rare the sword the small girl yielded he had to have it. He waited patiently in the shadows for the fated clash between the children to end. When they parted with Zoro, he followed her and attacked to get the sword. She barely escaped but with a mortal wound. That was the end for Kuina. Disgusted with people wanting swords for evil ways, Tashigi had to avenge her sister. Her high sense of justice, made her do that through the Marines, when she could have gone rogue. She took up swordsmanship seriously and decided to hunt down everyone who possessed legendary swords for evil purposes. What happened to her sister should not happen to anyone else. Kuina and Tashigi. Two women swordsmen(swordswomen? :P), who look very similar and are connected to Roronoa Zoro. We have only scratched the surface of possible theories and ideas here, so your feedback is much appreciated. What do you believe is their connection? Are they sisters, the same person or do they have no connection whatsoever? Share in the comments below! 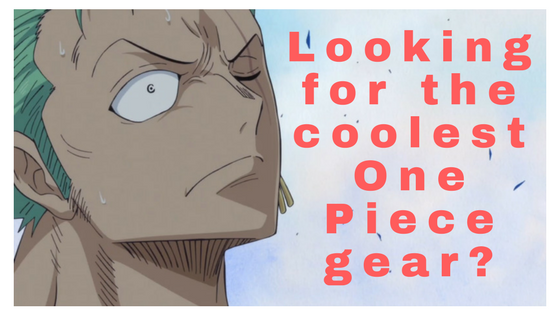 Also, head over to our recommendations page, for our top choices regarding One Piece :). Haha. 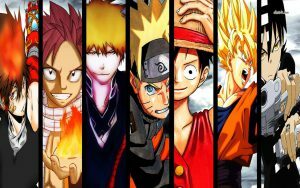 We all know One Piece will last forever Chris :P. Plot twists in anime and One Piece are quite common so why not? My son is OBSESSED with anime and he knew exactly who you were talking about in this blog post. He says he is going to start watching this show just so he can comment here 🙂 Thanks. Hello Hillary, happy he liked the post and hope he stays tuned for more, cheers! I am a one piece fan I always watch the latest episode. I like your article talks about different types of theories about one piece. The time I watched the video when zoro meet her I said to myself that it is her friend. But I have some questions. With your own thoughts what is ther connection? I use to be heavy in anime. I seen a few episodes here and there so I can kind of relate. I see the connection and noticed they looked almost the exact same and wondered if anyone else noticed. I believe they could be relatives, but I also like the same person theory as well. Glad you like the ideas. What do you mean by the real.catch though? Previous Previous post: Blackbeard Pirates One Piece – How do they steal devil fruits?